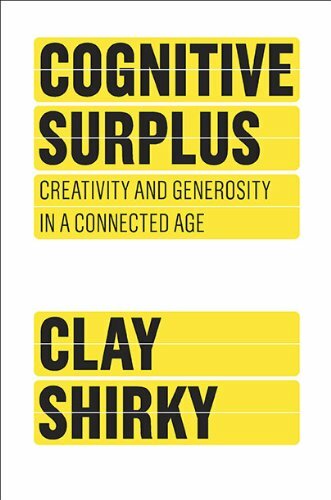 If you are an avid reader of everything Clay Skirky pens — and I’m going to assume most readers of this blog are — then the chapters you’ll find in his new book, Cognitive Surplus: Creativity and Generosity in a Connected Age, will seem quite familiar. In fact, as I was working my way through the book, I was reminded of a piece of advice my old boss David Boaz gave me once (but that I foolishly ignored several times over): Sometimes there’s no need to write a book when a good article with suffice. Is it really better to produce yet another lolcat than watch The Wire? And what about the consumption of literature? By Shirky’s standard, reading a complex novel is no different than imbibing High School Musical, and both are less worthwhile than creating something stupid online. While Shirky repeatedly downplays the importance of quality in creative production—he argues that mediocrity is a necessary side effect of increases in supply—I’d rather consume greatness than create yet another unfunny caption for a cat picture. It’s a fair point but I’m not sure how far you can go with it. As Shirky notes, “The great tension in media has always been that freedom and quality are conflicting goals.” (p. 47) No doubt, if you let the people speak, the people might say stupid things, “but increasing freedom to participate in the public conversation has compensating values,” Shirky argues (p. 47) “The low-quality material that comes with increased freedom accompanies the experimentation that creates the stuff we will end up prizing. That was true of the the printing press in the fifteenth century, and it’s true of the social media today.” (p. 51) That’s a point I’ve made before in my review of Andrew Keen’s Cult of the Amateur. Each era produced its fair share of quality and crap. There’s just more of both these days and that’s what some critics don’t seem willing to accept. But I’ll take that deal any day over the limited choices of the bygone scarcity era. That’s not to say there is anything inherently wrong with spending a certain amount with couch potato fare, be it TV, movies, music, or games. I think one can enjoy all those things in good measure alongside all the many wonders of cyberspace. It’s a wonderful thing that we have all of the above at our disposal. I’m less convinced by Shirky’s assertion that “The world’s cognitive surplus is so large that small changes can have huge ramifications in aggregate,” especially for politics. That digital technology and the Internet will help reshape society and politics to some degree is indisputable. But it don’t see it radically reshaping political systems or human nature. There’s a lot of fluffy talk and anecdotal examples in the book of how the cognitive surplus spawned by cyber-life has affected politics, advocacy, and “generosity,” but I think it’s a stretch to imply that the Net is going to upend political systems. Evgeny Morozov hits Shirky on some of these points in his Boston Review essay about the book. “[T]he Internet will not automatically preserve—never mind improve—the health of democratic politics,” Morozov noted. I also think Shirky also occasionally overplays the benefits of “cognitive surplus” to society, or he at least doesn’t give full weight to some of the potential downsides. “If you give people a way to act on their desire for autonomy and competence or generosity and sharing, they might take you up on it,” Shirky argues. (p. 95) Sure, or they might do nothing better than they did in the couch potato days. For every opportunity the Net and “cognitive surplus” opens up to do something special, it simultaneously opens up the potential to do something stupid, even wrong. So, while I agree with Shirky that “the Internet is an opportunity machine, a way for small groups to create new opportunities, at lower cost and with less hassles than ever before, and to advertise those opportunities to the largest set of potential participants in history” (p. 129), I’m just saying that one has to acknowledge the other side of the coin. He’s mostly just cheer-leading for the benefits or “positive shock to the combinability of knowledge” (p. 142) in this book. I’m also ambivalent about the possibility of increased civic virtue coming about because of the cognitive surplus. Shirky is a bit contradictory in the text on this point. At one point he boldly states that “The harnessing of our cognitive surplus allows people to behave in increasingly generous, public, and social ways, relative to their old status as consumers and couch potatoes.” (p. 63) Reading that, you’d be left to assume that none of us volunteered for anything in the past and that we just locked ourselves in our living rooms like asocial creeps. But that plainly was not the case. I find it very hard to believe that people are significantly more generous or civic-minded now because of the rise of the Net and digital technologies than they were in the analog era. And, later in the book, Shirky seems to concede that the matter is unsettled. “The amount of public and civic value we get out of our cognitive surplus is an open question, and one strongly affected by the culture of the groups doing the sharing, and by the culture of the larger society that those groups are embedded in.” (p. 176) “[W]e can’t count on new kinds of socially beneficial activities just happening,” he notes. (p. 185) Creating civic value is more complicated than that, he goes on to explain. In the end, it’s just hard to predict how much good will come about because of the cognitive surplus now at our disposal. “The bigger the opportunity offered by new tools,” Shirky concludes, “the less completely anyone can extrapolate the future from the previous shape of society.” (p. 188) “[W]e are absolutely terrible at predicting our own future behavior.” (p. 190) I agree wholeheartedly, but I wonder if Shirky realizes that in admitting this he is countering much of the bullish cheer-leading he is doing for the Net and cognitive surplus throughout the rest of his book. “People asking Where do people find the time? aren’t usually looking for an answer; the question is rhetorical and indicates that the speaker thinks certain activities are stupid.” (p. 20) That’s not always the case, but I think Shirky is generally on to something here. I enjoyed his discussion of the perils of being a snooty critic in the Information Age. “In a world where access to information is open, the critic does a delicate dance.” (p. 152) Basically, if you are going to assert an opinion about something–even if you are a supposed authority on the matter–you better be prepared to back it up with something of substance. So pick up Cognitive Surplus. It’s worth your time–even if you could just listen to this speech by Clay or Jerry Brito’s podcast interview with him and probably get the gist of the entire book in less than an hour. And just think of all the generous and socially-beneficial things you can do with all that “cognitive surplus” you will free up by not having to read the book! You know, like watching more YouTube videos.